This Argentinian only release has the same front cover as "Best In Brazil" except for the obvious different title in the top left hand corner. The reverse of the LP sleeve has the tracks written only in Spanish, although they are printed in both Spanish and English on the record itself. 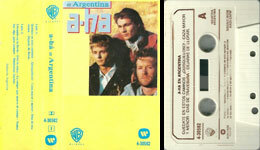 The cassette has a similar sleeve to the LP with the tracks printed in Spanish. The inside of the cassette sleeve is white with the tracks printed in black in Spanish and English. The cassette itself is cream with brown text. There is also a promo edition of the LP which comes with a 12" sized poster. 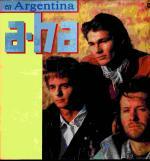 The poster is similar to the front sleeve of the album, but has adverts for the 4 a-ha albums at the bottom. The disc sticker features a black and white WB-logo (rather than the coloured logos which are on the regular album) and has a promo stamp. Tracks: Stay On These Roads / Touchy! / Hunting High And Low / Scoundrel Days / You'll End Up Crying // Crying In The Rain / You Are The One / The Blood That Moves The Body / There's Never A Forever Thing / Manhattan Skyline.